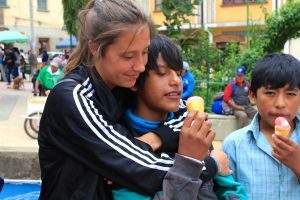 Laura S. (23) decided to go to La Paz/Bolivia from September 2015 until February 2016 as a student of psychology to do her internship in the children’s village of Huajchilla. She worked with all the children there for them to improve their emotional stability but she was mainly responsible for the Cabaña A, so the older boys. 1. Why did you decide to do this internship/this work as a volunteer? Because I love travelling and learning from other cultures! So I heard there was the possibility to do an internship abroad and I wanted to take the challenge. 2. Why Alalay? Why Bolivia? To be honest … As I was on vacation when we had to hand in all the required documents, my friends did it for me without telling me anything. So in fact it was a big surprise for me when I came back home. 3. Daily routine – what did you have to do? Did your activities change within time? What did you like most? What did you experience to be exhausting? We had to organize some activities with the children that should help them to express their feelings. We helped them with their (home-)works. Besides we always ate and played with them and during summer vacations (December-January) we had to plan the activities. 4. What was it like to communicate with the kids? Was it difficult because of the language? How would you describe your relationship with the children? I spent most time with the older boys, so building up my relationship with them took some time because they are not as open as the smaller children. But as my Spanish wasn’t perfect, they always laughed with me, and they ended up trusting me and so they accepted me! I taught them some things, but they also taught me a lot of things. Especially about life in general. 5. Tell me please one of your most beautiful experiences during your time at Alalay or a very touching experience. and happy faces and bounding with every child was AMAZING. 6. Were there also things that were annoying you or that were hard? Why? What would you consider as the biggest challenge? 7. In what way have the expectations you had before you went to Bolivia been confirmed or been refuted? I would say confirmed. I was sure that I would love these children very deeply and that leaving would be very painful. But I also knew that it would be such a life experience, and it came this way. 8. What was your goodbye like? And your first time back home again? I was crying every day. It was the hardest thing I ever did. But I’m still trying to send little things like letters and candy and stuff like that to stay in contact. 9. Do you think that the work influenced you or your future? Do you often think about the children, the country, the organisation? I think love always has an influence. Even if you don’t stay there forever … you were there in moments when they really needed someone, and you showed them that they are so loved. 10. Apart from the work, how would you describe the country and the Bolivian way of life? The safety in the country, the social situation, the travelling,… What did you like most? What annoyed you? I don’t know, I really loved Bolivia. I never felt unsafe. The only thing they tried to do was asking for more money, but that’s it. I totally recommend going there to everybody – it’s a very special place. 11. Did you ever regret your decision of having gone to Bolivia? NOT ONE SECOND! Not only because my experience with the children but also because of the new friendships I made there.